"I had a moose roast sitting in my freezer for a couple of months, because I had no idea how to cook it, not being a wild game fan. A friend suggested this method of cooking it and it was delicious. I made it at Christmas along with the turkey, thinking my guests could have a taste and I wouldn't have to feel guilty about it being in my freezer anymore, but it was the hit of the dinner!" Heat oil in a large skillet over medium-high heat. Brown the roast on all sides in the hot oil. Remove, and transfer to a slow cooker. Sprinkle onion soup mix over the roast, then pour in the apple juice. Cover and cook on MEDIUM for 6 to 8 hours, or until meat is very tender. Check occasionally to make sure there is sufficient liquid, and add more juice if necessary. 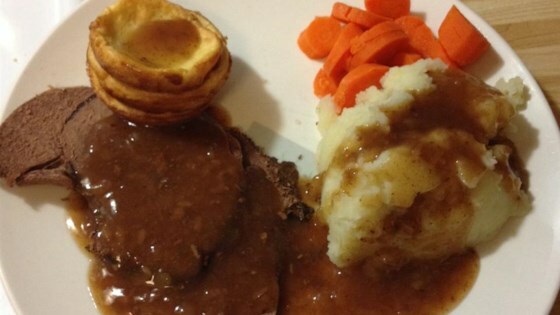 Serve roast with juices, or thicken them for a tasty gravy. I will say that the gamey taste was completely gone, but, otherwise there just wasn't much to this recipe to make it special. Thanks anyway! Such an easy recipe. My family loves it. I have made this a few times any knorr soup mix can be used. my favorites are the vegetable and leek. My great grandmother also loves this recipe. This was excellent. I also added a can of condensed french onion soup and some potatoes. The flavor was great and the roast tender. Thanks! This was a big hit with everyone! My fussy sister in law who always said she disliked Moose meat couldn't get enough!